Right now I am deep into character traits in my classroom. And it is so delightful! I just love talking to students about characters and how we know what they are like. Discussions of character actions and dialogue and the traits they reveal are so enriching for our class. Each year I enter into these discussions in slightly different ways. However, some principles guide my lesson planning each year. Here is an overview of my thinking as I embark on a character traits unit. I love embedded questions! I remember days of standing by the copier, patiently cutting apart a story so that I could add questions throughout the text. Digital tools make the process much, much easier. Embedded questions aren't about assessing students, but about guiding students toward making inferences. 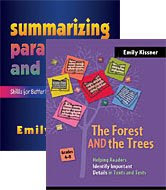 Transitional readers especially often think of reading a page of text as a monumental effort to be completed as quickly as possible. Embedding questions helps to break up the text and show readers what kinds of inferences they should make at which parts of the story. "Thomas and the Teapot", in Character Traits and Emotions, is an example of a text with embedded questions. However, you can use any text for this strategy. Support, support, support! This is my refrain as we talk about character traits. "What in the story makes you think that?" or "How did you come to think of this trait?" Graphic organizers help students to collect character traits and text evidence as they go. Scaffolded response frames help students who are still learning the structure of formal academic responses. You can read more about response frames in this blog post. Oh, I hate to see when well-intentioned people muddy the waters between traits and emotions! Traits usually don't change over the course of a story. When they do, the change is usually the main point of a story. Emotions, on the other hand, change frequently based on the events in the story. Teaching character traits, just like teaching theme, helps students to see those parts of literature that make us more human. And the language of the traits becomes the language of our classroom. "That was foolhardy of the cricket, to try to escape," one student mused thoughtfully. I was watching the chaos of the escaped cricket (I finally had to stoop down and catch it myself, and I did teach for the next five minutes with a squirming cricket enclosed tightly in my hand) and I thought, "Wow! She used a character trait word!" -A slug escaped, and was nowhere to be found. How could a slug hide in the classroom? We are completely mystified. Just as a side note, the weight of the slug was 31 grams...we found this out shortly before he escaped. -I am working on third grade homework sets. Their formatting is simpler than the 4/5 homework sets, and I'd love to have someone else look over them. There are currently 3 available with the fourth coming shortly. -Character traits materials are available on Frolyc.com! If you have student iPads, these are a great way to build character trait knowledge. -I'm adding some new materials to stories, but I probably won't have time to upload new sets this week. If you are teaching "Hans, the Princess, and the Golden Goose" from Teaching About Theme or "Painting Day" from Summarizing Stories, drop me a line at elkissn@yahoo.com and I'll send you some of the new materials. Day 20 has come and gone! Independent reading has settled into a routine--kind of. Sadly, this is the time of year when many teachers abandon independent reading. The initial thrill of start-up has ended, and teachers are feeling pressure to move on to more academic pursuits. It can be easy to skip independent reading "just for today"--and then tomorrow, and the next day, and before you know it, kids just aren't bringing books to class anymore. But this is the time of year to stick with independent reading! These are some of the personalities that I have observed in my readers, and how I deal with them. There is very much a sense of Zen in working with readers. There are no hard and fast rules, until there are. Oh, these are the kids that are giving me gray hair! One day I will get a kid set up with a supportive book talk. They will seem engaged with the text. The next day? No book. "I left it in my desk" or "I left it at home." Even worse, sometimes these readers will grab a new book off the shelf. It's hard to keep from getting frustrated in these situations. However, these readers need an unfailingly positive atmosphere. Something about "we read the same book each day, because it makes a complete story" just isn't sinking in. If I don't fix this in fourth grade, it may never get fixed! A simple "Still-Reading" box is a great help. I have a box in the room for students to keep classroom books in. If kids have trouble bringing books back and forth to class, have them keep their books in the room. It's also important for me to keep track of the books that kids are reading so that they don't slip into flitting day after day. Finally, it is for these readers that I try to stick with read-aloud. Even if they never finish a whole book on their own, they will hear an entire book and get a sense of what a connected work is like. These are the readers who decide early in the year that they are going to stick with one kind of book. It might be a series, or it might be an author. In my experience, narrow readers are often boys, and they are often on the edge of struggle with grade level text. I've learned that this quirk of independent reading is often quite helpful, and should be allowed as much as possible. I've even gone out and purchased more books in the series for these kids! These readers don't begin to worry me until this time of the year. In the first few weeks of school, acquisitional readers look like they are doing all the right things--they bring books to class and they look like they are reading. Often the books these readers have are big and on or above grade level. But it's around this time that I start to realize that these readers aren't finishing the big beautiful books they are lugging around. They might switch between three books at a time, gaining only hazy representations of the plots. So I go to my cabinet of totally awesome books and offer three supportive book talks. I choose books that are tailored to what I know about the student's interests. They look at each book, make a face, and say, "Nahhh." This is tough. It's hard to not feel a bit insulted after such rejection. In fact, lately I've been sending it back to these students. "Maybe the books that I have are not interesting for you, and that's fine. But you will now need to be responsible for your book selection, or you will need to read the next book that I choose for you." And do you know what? Often these students do read the next book that I choose for them. I've had a few students in the last week who have delighted me in unexpected ways. Some of these readers have been very quiet students. I've gone to get them some book choices and they have piped up, "Can I have Amulet?" or "Can I have that book that you were telling someone about last week, where the parents disappeared and there was a castle?" I realized that some kids were listening in on all of the supportive book talks--and, even better, they were silently gathering recommendations. By Day 20 I have earned some students' trust so completely that I think they would read anything I recommend. I take this trust very seriously and talk about next book selections honestly. "This is a stretch from what you've read before, but I think you might like it," or "This book just came in and I think you'd love it!" Sometimes all I have to do is stand by the cabinet with a book in my hand, no words needed, and 2-3 kids will come over to see what I have for them. These are the best moments. And, of course, every class has the delightful group of students who would be happy to read all day. They choose their own books, carry them from place to place, and bury themselves in the story whenever they get a chance. My main task with these students is to stick with independent reading--and to structure a happy, productive time for everyone. If it's September, I must be teaching about story elements. 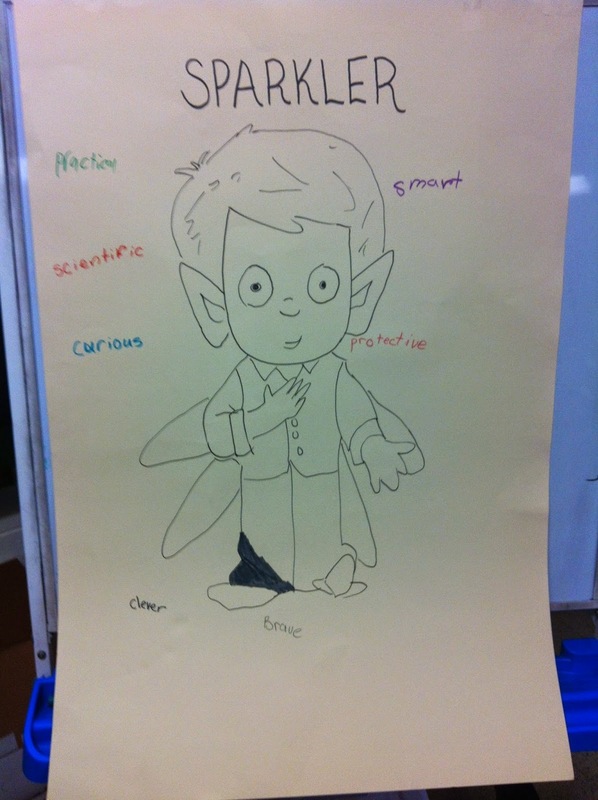 This week, we have been taking a careful look at character traits. I had to do some quick edits to the classroom version of my Character Traits Powerpoint to delete the pictures of my son--after all, I can't embarrass him by having him on the screen during a lesson! During each reading session, a student sits in the "place of honor" beside the large picture of the character and records the character traits that we develop during the reading. As you can see, Sparkler is clever, brave, curious, and protective. These were traits that students already knew and suggested on their own. After our preliminary readings to test the waters, I was ready to introduce character traits more formally. I used my (edited) version of the PowerPoint to introduce traits and supporting traits with examples. I gave students a list of character traits. Then, we read more about Sparkler in the Tollins book. I modeled how to use this simple chart to record examples of traits and actions. In our justification, we have to show how the two pieces of information go together. Rule or justification: Someone who is persistent works hard and doesn't give up. Copying the books was hard work for Sparkler, but he didn't give up. I showed students the response frame that includes a place for the character trait, character actions or word, and justification. After I introduced the task, I differentiated by student choice. Students who were ready to work on their own could go work quietly wherever they wanted in the room, while students who still needed some help could stay at the front with me. This was a very productive time for students. This process requires a level of thinking that is tough for fourth graders! However, breaking the process down into the three different tasks was very helpful. It was also helpful to begin this tough level of thinking with shared, engaging text. Students could move through working with evidence, trait, and justification. While I would love to say that everyone got it perfectly after just one attempt, anyone who has actually been in a classroom knows that it is a long process. But it is a fruitful one--teaching students how to justify their text evidence in this particular case is easily transferable to other situations. Right now I'm working with teaching about stories and story elements in my classroom. This instruction has shifted a great deal in the last few years. As we've moved to the Common Core, I've taken on many topics that are new to fourth grade (like point of view) and delved more deeply into existing topics, like plot and conflict. Some activities and strategies remain helpful for fourth graders. For example, I have always liked having students arrange story events. I type the events in a table, cut them out, and ask students to work with partners to put the events in order. This simple activity shows me so much about what students can do. Sometimes they struggle to put the events in order. I encourage them to look back to the text. When students don't have trouble putting the events in order, I ask, "Which ones could we leave out?" This prepares students for summarizing, when they will need to select the most important events and leave out events that are not important. This year, I used the sorting activity to frame a discussion about the parts of the story. 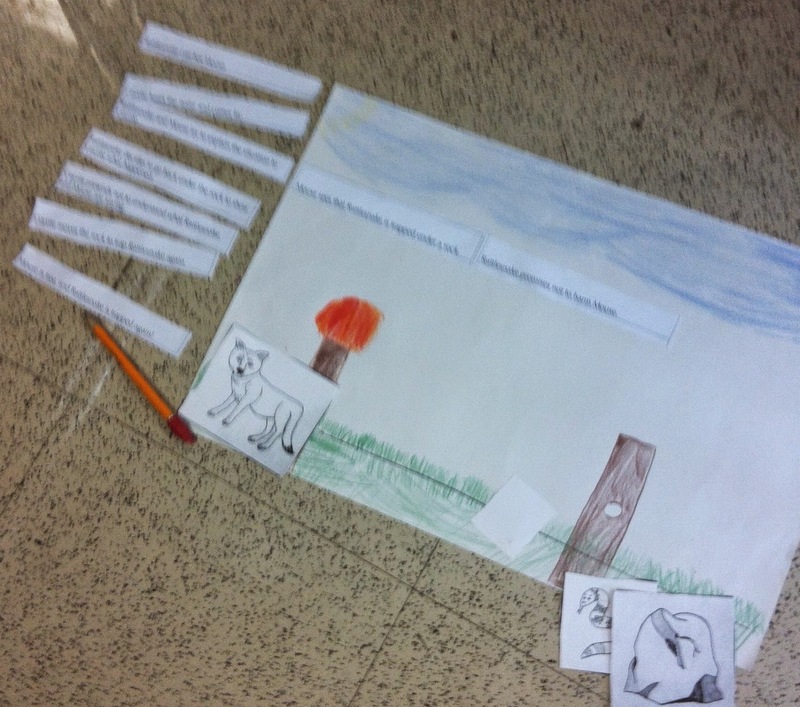 Students worked with partners to put the events from the story in order. Then, we quickly talked about the climax of the story. This was a new word for many students. Many typical definitions for climax say that it is the most intense part of the story, or the part that has the most action. Definitions that show climax in terms of "excitement" often set kids up for frustration--after all, many stories do not have an exciting battle! Instead of defining climax in terms of excitement, I told students that the climax is the turning point--when the conflict begins to be resolved. After we watched the commercial, we tried to examine where we saw the climax. Partners quickly realized that in order to describe the climax, they needed to have an understanding of the conflict. They tried to hash out whether the conflict was the farmer's use of the land ("Maybe he doesn't have enough food, now that it's winter?" one student guessed) or the farmer's feelings about what has happened. On the second viewing, they were able to find the climax. One student put it succinctly: "The farmer is like, 'Oh, no, what have I done?'" Another student pointed out that the music reveals the climax: "They give it away! It's in the words of the song!" Students then took their new understanding of climax back to their sorted story events. I asked, "Which event from the story is the climax? Why do you think this?" Students then discussed their ideas...and there was a wide variation of choices. We were working with a retelling of a fairy tale, "The Miller's Boy". Some students chose events from the beginning of the story, which seemed quite off at first until I realized that they were drawn to what I'd call the initiating event--the event that introduces the conflict of the story. Once I suggested that they look closer to the end of the story, most groups were able to find and support an event that they called the climax. One group noticed that the author (me, but they didn't really know it) had added a secondary conflict related to the character of Tobias. Looking through this lens, the climax came at a slightly different point. I love it when an activity presents several equally plausible answers! Listening to the conversations was fascinating. I realized that an understanding of plot structure depends on a clear understanding of the conflict of a story. Without knowing the protagonist's goal, readers can't pin events to an over-arching structure. I ended by asking, "What will you do differently when we read our next story? What will you look for? What will you consider?" Some students said they would look for the climax of the story. Others said they would look more carefully for the conflict. I'm looking forward to our conversations about both. Teaching science goes so well with teaching writing! Kids naturally enjoy learning about science. When they learn, they want to write...and they have to grapple with the best ways to express their ideas. Writing instruction blossoms from science activities. But it's not always so simple, of course. It does take some planning, some preparation, and a big dash of serendipity to get the most out of the connections between science and writing. The planning may not always be what teachers typically think of as planning. It's not always writing essential questions in little boxes! Squeezing the most learning out of teachable moments requires a broad knowledge of both science and writing standards. In addition, I try to learn as much as I can about the background details of what I am teaching. So I take every chance to learn about geology, animal adaptations, day/night, and seasonal changes...I know that I may have to draw on this knowledge to guide student investigations. Following scientists and museums on Twitter is an easy way to build my background knowledge. Luckily my kids like "adventuring" so we all learn together. Science writing starts with the informal activities that I have in the classroom. Toads, crickets, and praying mantises are all highly motivating for students, and a great way to get kids writing. We draw pictures, add labels, and take notes. In third and fourth grades, students have trouble generating data tables independently, so this is a task that I take on at first. I like to have a Bird Observation binder for students to record what we see at the window. When students take notes, other students sometimes ask questions: "What were they doing? How many did you see?" These are the kinds of questions that scientists as writers need to answer! Trays set up for our litmus paper experiment. Even a task as mundane as lunch count can be the beginning of science writing. I have a student keeping track of our menu items and # buying and packing each day. Today he came to show me an interesting anomaly in the data. Little does he know that this data will be used next week when we talk about drawing conclusions! Scientists also need opportunities for formal writing. One thing that I have learned is that students thrive on real experiences and clear prompts. 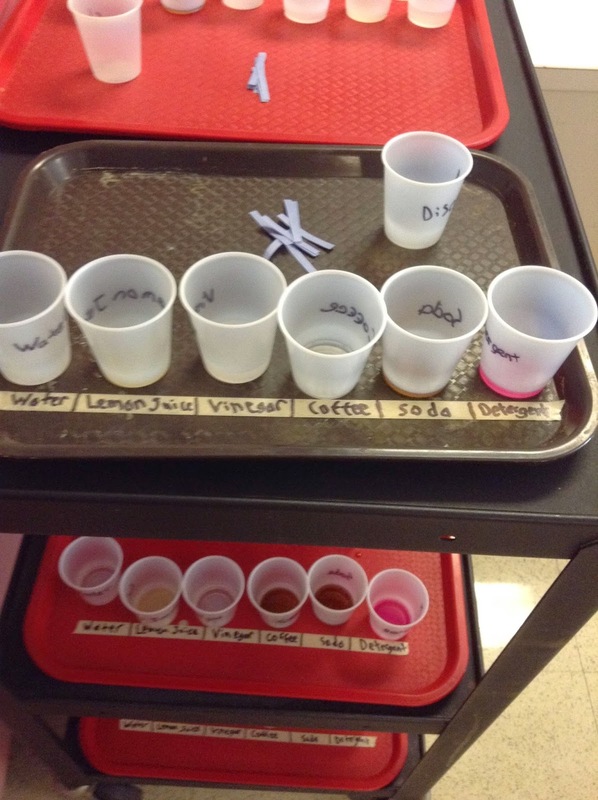 Last week, while learning about classification, students classified liquids as acids or not acids, using litmus paper as an indicator. scientists, of course!) The writing frame helps students to see the kind of formal writing and sentence structure used in this kind of science writing. Students also enjoyed signing their names as "Mr." or "Miss" at the end. In future writing prompts, students will take on varying roles. We do these prompts about once a month, and they always relate directly to activities we have done in class. 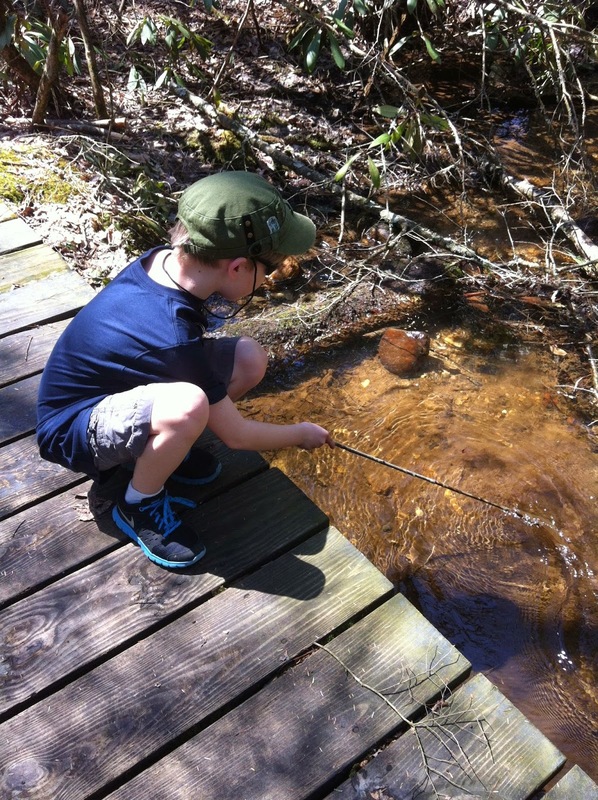 Engaging real life experiences enrich student writing. Students elaborate more and use richer vocabulary when they are writing about class experiences. Advance planning, informal experiences, and formal writing opportunities help students to see the natural connections between science and writing. -A new version of November Reading Homework is now available. Revised file numbers, minor formatting updates, and an end of month assessment are available. -In my classroom this week, I'm using character traits materials from Character Traits and Emotions along with stories from Teaching About Theme. -Check out the great tutorials on Frolyc! Frolyc is a way to publish activities to student iPads. Many of my texts are available. You can hear me explain how to build these activities on the YouTube playlist. I really enjoy reading educational research articles. The authors are pleasantly careful and measured in their descriptions of studies and conclusions. Instead of making huge claims and offering easy solutions, real educational research articles are like quiet coffee-time conversations. Authors work hard not to overstep and over-generalize. As a reader, I'm left with plenty of ideas to consider and think about as I watch the learners in my classroom. In the course of this reading, I've found many new concepts and ways of thinking about reading, like the Simple View of reading, Four Resources Model, and task feedback. These different concepts have changed how I teach. This is why I'm so delighted to have been given a copy of Developing Literacy in the Primary Classroom by Gary Woolley. Dr. Woolley's articles have been a deep influence on my teaching, especially as I teach students how to visualizing and self-monitor. Now, he has put together an easy-to-read yet comprehensive resource for teaching reading in elementary schools. All kinds of new and interesting models are discussed, with digital resources embedded within chapters and given a chapter of their own as well. 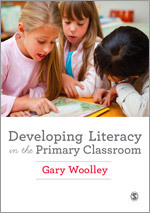 As Dr. Woolley works in Australia, this book offers American readers a refreshing change from constant talk of the Common Core. But strong literacy instruction is good practice no matter what you call it or what standards you apply to it. Reading and writing combine a number of different processes, and awareness of those processes helps teachers to design the best classroom environment and learning experiences. What a week! After a relatively cool summer, Pennsylvania enjoyed (?) some hot and humid temperatures this week. I used old-fashioned heat management strategies like closing my blinds at 10 and starting fans early in the morning to pull in cool air. These strategies kept the temperature in my room to a manageable 86 degrees. The kids were amazing about it and never complained. One of the nicest parts of my week was going back to some tried and true activities that should be part of every literacy teacher's repertoire of techniques. Even in the heat, these activities were engaging and fun for everyone involved. I first saw the Making Big Words activity back when I was doing my first round of graduate classes, and I started using it in middle school immediately. It is one of those rare activities that fits every ability level. What I love is that it gives me instant information about how kids approach words and word-making. Every student in fourth grade used the same set of letter tiles this week, but as they were divided into our intervention groups we could see how each group dealt with the challenges. For example, students in the ESL group struggled with changing shop to shoe because of the odd spelling pattern in shoe. In my grade level group, I saw many different spellings of poison--poisen, posion--which shows me that unaccented final syllables are a topic to explore. It is a fabulous activity to get to know a new group of students and get real-time information on how they are processing and working with words. You can read my ancient review of Making More Big Words at Amazon--a relic from before I started blogging! When students have trouble comprehending a text, retelling with figures is my go-to plan. The idea grew from my days as a preschool teacher, when I used felt figures to tell stories. (Remember feltboards? Does anyone use them anymore?) With older students, having figures to retell the events in a story helps them to attach meaning to the events. Students have a visual cue for retelling and have fun manipulating the figures. to retell key ideas from an expository text. 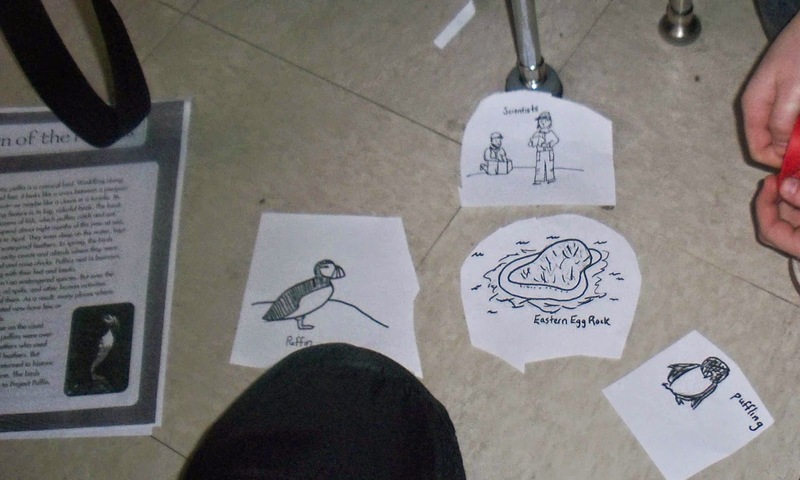 This week, students in one of my reading classes read "Clever Coyote" and then retold the story using four pictures: a coyote, a mouse, a rock, and a rattlesnake. Watching them retell in pairs helped me to see how they were comprehending the events of the story. This story worked especially well because the plot hinges on the locations of the characters. You can read more about retelling with figures at this blog post. I have some sets of retelling figures and stories available in Analyzing Story Elements (Gwen and the Witch) and Summarizing Stories (The Magic Key). Settling into our literacy routines has become so meaningful and enriching. Even though I have done these activities many time before, I always love seeing how new students engage with them. What are your tried and true activities that you return to, year after year?